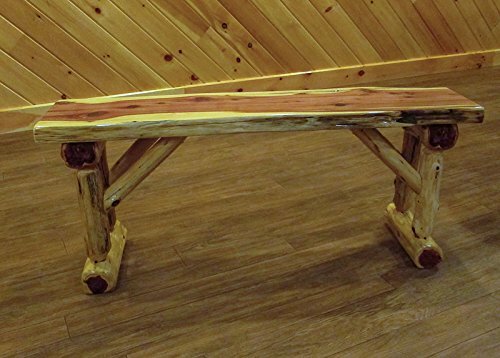 Absolutely nothing compares to the distinctive elegance of hand-crafted rustic Red Cedar Log furniture. An superb selection for a rustic mountain lodge, ski cabin, country cottage, and much a lot more. Red Cedar logs have a beautiful light tone on the outside and striking bright red cedar coloring on the within. Constructed by skilled Amish craftsmen, our products are sanded and lacquered for attractiveness and sturdiness. Sturdy and significant, these things will final generations. Last picture depicts checking... Each White and Red Cedar Log furniture are topic to the natural process of checking as the wood \"seasons\" and dries. Checking happens as wood releases moisture across or via the yearly growth rings - it does not influence the structural performance or the integrity of the wood. Checking adds unique attractiveness to the log furnishings. Varying amounts of checking could happen on any given piece of cedar log furniture and are not able to be controlled by the builder. Checking is not an indication of damaged furnishings. The beauty and scent of red cedar is unmatched! The gorgeous contrast of hues truly complement any space, with striking natural style. All custom made. Professionally applied lacquer finish for added beauty and durability, Amish made in the USA, Mortis and Tennon Joinery, Substantial and Sturdy Approx. 6" Diameter Red Cedar Logs, Due to variability in logs, each item will be unique, may vary from photographs.